A healthy smile is priceless and superior dental care is a worthwhile investment in your quality of life. But the cost for treatment and precision restorations can sometimes be prohibitive. 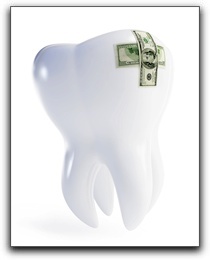 Knowing what to expect price-wise can make your dental visit more palatable. Obviously, the cost of some procedures such as crowns versus fillings are dependent upon unknown factors. X-rays can show the basic problem but sometimes the extent of the damage isn’t clear until we get in there. Our caring staff works to offer estimates based on best-case and worst-case scenarios. Nailing down the cost is much easier once the overall treatment plan is established. Doctor Larry Johnson performs an oral exam, reviews the patient’s dental history, and consults with the patient before creating an estimate. The price is influenced by the patient’s current condition, cosmetic goals, and long-term functionality. Usually, the cost of treatments such as teeth whitening, dental implants, veneers, denture fittings, and the price of cosmetic dentistry can be explained at the initial consultation with Doctor Johnson. We encourage our patients to take some time to review the options before they pick which elective procedures to pursue. We never pressure our patients to make a quick decision about something as important as dental treatment. Here at Cornertown Dentistry, we are enthusiastic about customized patient-focused care. Often the treatment plan will be extended over several visits to allow healing and adjustment in the mouth before doing more work. With restorations, the most conservative treatment is always preferred. The cost is weighed with priority for adequate eating and speaking functionality. Personal confidence in appearance is also taken into account and given priority. Doctor Johnson has been practicing remarketable dentistry since 2007. If you are in the market for dental implants or restorations but are worried about how much it will set you back or whether your insurance company covers the procedure, then call 801.938.3466 today and let us look into it for you. Feel free to shop around and compare our economical prices to other dentists in the area – but be wary of bargain-basement dental advertisements. Many ads present a false picture of the actual cost of the treatment. And, do you really want to trust your smile to the lowest bidder?